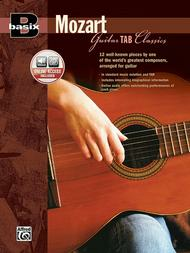 Basix Guitar TAB Classics -- Mozart composed by Wolfgang Amadeus Mozart (1756-1791). For Guitar. Classical Guitar Folio; Masterworks. Basix® Series. Classical; Masterwork Arrangement. Book & CD. 44 pages. Published by Alfred Music (AP.22633).ISBN 0739034057. Classical; Masterwork Arrangement.13 well-known pieces by one of the world's greatest composers arranged for guitar in standard music notation and TAB. The accompanying CD offers outstanding performances of each piece.